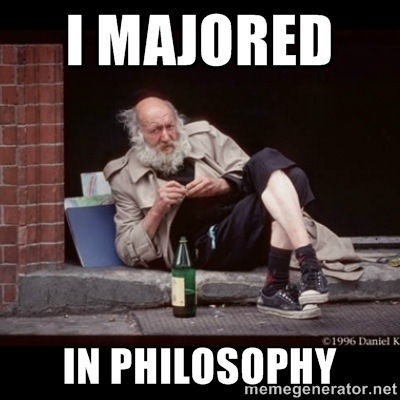 Does your major say something about your personality? Does the degree or major you chose really determine the amount of respect you receive? You might read this and say “yes, of course, some degrees are more difficult and those graduates deserve more respect because they are clearly more intelligent”. I don’t think that that is a fair assessment. Maybe it is more a matter of over simpiflication. I don’t know if you can accurately judge a person simply by the degree they chose. 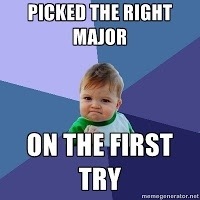 There are many people that only choose a major because they happened to have the most credits in a certain department. I have a reason for being skeptical about this since I am one of those odd ducks that really can’t be described according to my schooling. I have taken courses in almost every department; not because I am indecisive but because I have so many interests and I don’t want to limit myself. In high school I was in advanced placement course and always on the honor roll. I was accepted to a top business school but after a year of that I realized that even though this was a practical degree it wasn’t something I was remotely passionate about. I ended up going the complete opposite direction and went to art school. Many people are pretty surprised when they find that out. There are few people that are accepted to both business school and art school. I could have graduated from business school and maybe that would have looked better on a resume but I didn’t. It doesn’t change the type of person I am. It doesn’t change my work ethic. So what can you really know about me from knowing that I graduated from art school? I guess that I am creative, I know how to pull an all nighter and I can take criticism. 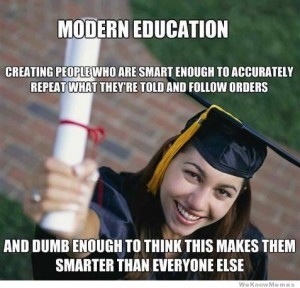 But I’m sure those qualities apply to a lot of individuals who went to many different schools and studied different subjects. In an ideal world, the specific degree you took wouldn’t matter as much as the person. More jobs should offer to train new employees, mould them to be exactly what they want. Not expect people to graduate school and have all the skills and experience that they require; it is not very realistic. I always thought that graduates were supposed to bright and eager but it seems that they are seen as priveldged and entitled. I supposed there must be some true stereotypes out there. Usually stereotypes are based on some sort of commonality. Maybe a majority of engineers love to eat tacos and their favorite color is red. Maybe history majors are obsessed with Steven King and sleep in satin sheets. If you couldn’t tell, these are completely made up characteristics, but who knows, maybe it applies to some of them. I don’t know enough of one group to make statements like that. Even if I did, I wouldn’t feel comfortable making claims since I am sure there are a few like me who are “well rounded”. It seems weird to say that about myself but I think it is an appropriate word. I have never fit into one group; I have always been able to drift between different groups because of my wide range of interests. I guess my question at the end of all of this is really, what is better? Should someone be focused on one speciality, one or two interests and dedicate everything they have to that or should they try different things and different hobbies. 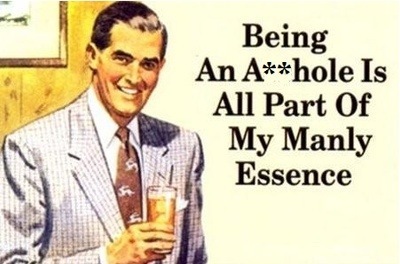 I always say “I’m a jack of all trades, master of none”. I guess that is what you give up if you try to widen your circle of knowledge. I’m sure if you wanted to become a brain surgeon most of your time, if not all, would be devoted to medicine and the brain. Personally, I am happy being how I am. I don’t think I will ever burn out because I dedicate myself to a varitey of subjects. I am usually above average at whatever I try my hand at simply because when I do something I do it all the way but I doubt I will ever become the best at anything. I think I am okay with that. I’ll stick to my reading, writing, designing, weaving, drawing etc. I feel this is a debate that often goes on during the hiring process. Which should be placed higher, skills or credentials? If someone teaches themselves how to code is that better or worse than someone who learnt while getting a degree in web design. They know how to do the same thing but one of them has the paper to back it up. What about something someone is naturally skilled at, does the skill count if there isn’t a certificate to confirm it? The problem I often encounter with job postings is that I go down the skills needed, check, the responsibilities and tasks of the job, yup, I can do those, then I get to the school/experience part. Many times employers want a specific degree, it doesn’t matter that you have the skills to do the job, if you don’t have the degree which they request your resume isn’t going too far. Definitely not going on the short stack. It used to be that as long as you had a degree, in anything really, it counted for something; showed you are capable of completing something, were committed to working towards something for at least four years. 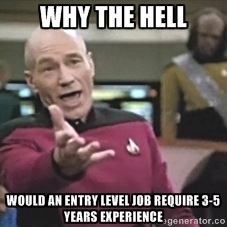 Another pet peeve is extensive experience required for entry level positions. Isn’t the point of entry level jobs that you don’t need too much experience? If I am just coming out of school how am I supposed to get any type of job if I need five years experience to get an entry level job; one most likely below my skill set to start with. Most jobs like that you can learn pretty quickly, if it is taking you five years to master answering phones you may want to reevaluate your life. The whole idea behind ‘entry level’ jobs is so people right out of school can work up the ladder. 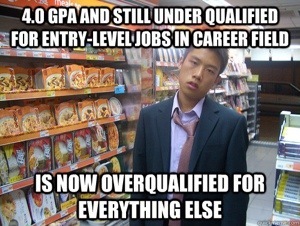 Back in the day, going to college meant you could skip the entry level and go straight to a mid-level career. Ah, the good old days. Of course I was not in the job market during that time but I have heard the myth from my elders. The myth of how going to college guarantees you a decent job. Oh elders, how you have led me astray. I understand the theory behind these methods. They are put in place to weed out applicants. 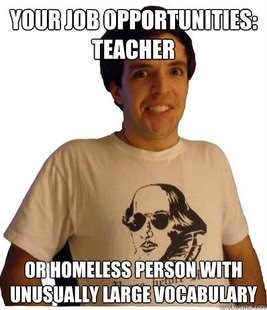 But it makes it really hard for people trying to enter the job market when employers are being so picky. Is the job market really so much different now than it was a few years ago? What changed so much that a college degree can get you a retail job but not much else? Can we revolt? Start a revolution of some sort? Well if I do become the face of a revolution at the very least it will be one more thing to put on my resume! I had this friend that I had known for a years. She was one of my best friends, we told each other everything. She knew everything about me and I knew everything about her; or so I thought. She had a story for everything, some were ordinary but some were completely outrageous. They ranged from eating strange objects as a child, having ghosts in her house that had to be exercised, knowing someone who was a drug addict on skid row and everything in between. I would tell my mom these stories excitedly because they seemed so crazy and interesting and after a while my mom started to doubt their authenticity. How could one, ordinary, middle class girl, have had so many things happen to her and her family? But she was my friend and I believed her; every word. To me it didn’t make sense that she would be lying. What was she gaining? I was already her friend, I had known her for years, why would she keep lying? She was a really spontaneous person. I never knew what I would be coming home to (oh, did I mention we were roommates too?). A couple times it was a new pet, sometimes a new piercing or tattoo, maybe a new craze diet. Whatever it was, she would get it in her head and be obsessed with it. She would decide that facebook was evil and delete her account (for about a week then reactivated it), she would be really into yoga one week then it would be the gym everyday instead. Whatever it was she would go all out for a few days then it would calm down. Looking back I wonder if maybe she had something going on like OCD or some other kind of obsessive disorder. One day she decided that she didn’t want to be my friend anymore. Moved out when I wasn’t home and left the key under the door. I often look back on her stories and wonder how much was true. When a couple stories started to unravel it made me question everything. That’s the trouble with lies, they aren’t just stories you tell, it is a trust that you are breaking. When someone discovers a lie it makes them question everything else that they are told. The person becomes a ‘liar’ in their eyes and it is hard to come back from that. It is sad to think of our friendship because, like I said, now I don’t know how much was true. How much did I actually know about her? Currently I don’t even know where she is living, my attempts to stay in contact after she moved out where rebuffed. I guess I’ll never know what was real and what were lies. Stress is a funny thing. If you look it up it apparently leads to everything from the common cold to the big C. Everyone has their own way of dealing with it and some could say it could almost be beneficial. Having the stress of a deadline makes some people focus and work harder. Some people deal with their stress by running or going to the gym. Other people clean, because if they can’t clean their mind at least they can clean their surroundings. Then there are people like me. When I get overwhelmed I sleep. It really is not productive and probably makes my stress worse because then I just end up having less time to do whatever it is that needs to get done. I wish I was one of those workout people. Can you imagine how great that would be? Every time you feel stressed you go to the gym? I would be a body builder within a month at the rate that my mind worries about things. You still don’t get done what you need to do but at least you will have abs to show for it. I have come up with a term for my coping technique; I call it ostriching. Like the ostrich, when faced with some sort of threat I hide from the world and avoid the situation. (Okay, so ostriches don’t actually bury their heads in the sand, it is a myth, but I still think that it illustrates my point quite well). Some days I just feel overwhelmed, like the whole world is on my shoulders, and on days like that I can’t function. I can literally lay in bed and stare at the wall or ceiling for hours. 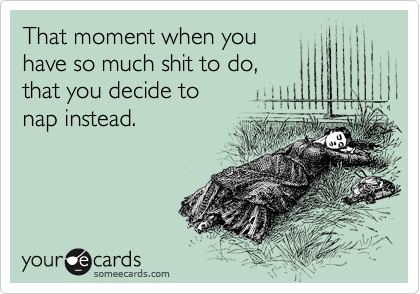 When I try and be productive I just can’t. Then, because I know I am being extremely useless, I feel worse, so I try and be productive but can’t and so on and so forth. 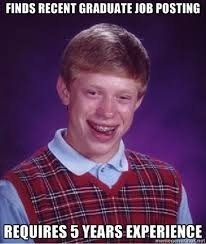 It is really a vicious circle. I could be completely fine and back to my happy, bubbly self the next day but that previous day is a write off. 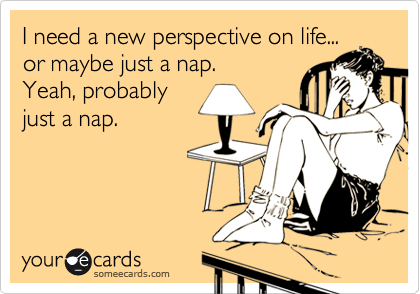 I find naps can really help, for a few different reasons. It gives me a bit of an escape from my reality. If I can manage to sleep my brain will focus on dreams and not on everything I need to do, remember, accomplish etc. It gives me a break from my mind battling about whether it makes sense to take a break or not. It is a little like the angel and devil on your shoulder idea. One part of me says ‘take a break, it’s good for you when you are stressed, you deserve it’ then the other part says ‘why do you deserve it? What have you accomplished today?’. Sleeping is an escape from that. Another great reason is that right before I fall asleep I get really creative. I come up with ideas for projects, solutions to problems and everything in between. Some times just laying there thinking helps me break down what I need to do in steps and allows me to visualize the task/s at hand. Moral of the story: If you are not productive when dealing with stress, that’s okay. You aren’t alone. It is about balancing, like everything in life. Sleeping all day, everyday is not healthy but neither is going until you break down. If you feel overwhelmed, take a break, regroup and maybe take a nap. It could make all the difference!